The junior and senior students who take French decided to throw a party to celebrate French culture, just as the spanish classes did earlier in the year with Spanish Day. Eclairs, croissants, fresh frappucinos and even homemade waffles were served. Les élèves de la classe de français savent vraiment comment donner une grande fête! The students in French class really know how to throw a great party! Before Purim, Yeshivah of Flatbush Freshmen were very excited to receive a handout with an abridged version of Megilat Esther. However, this version was nothing like they had seen before. This version was in Spanish. 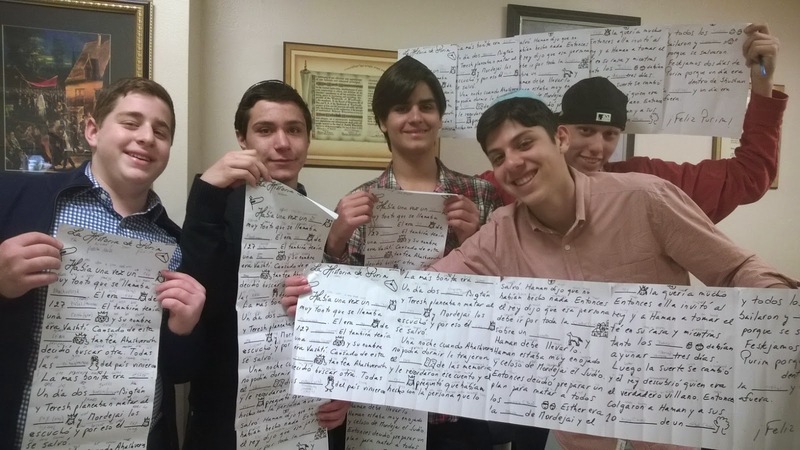 In their Spanish class, students filled out vocabulary words related to the topic of Purim and rolled the paper in the shape of a scroll to show their parents during the Seuda. This was an exciting way of learning Spanish as well as enjoying the Purim spirit. 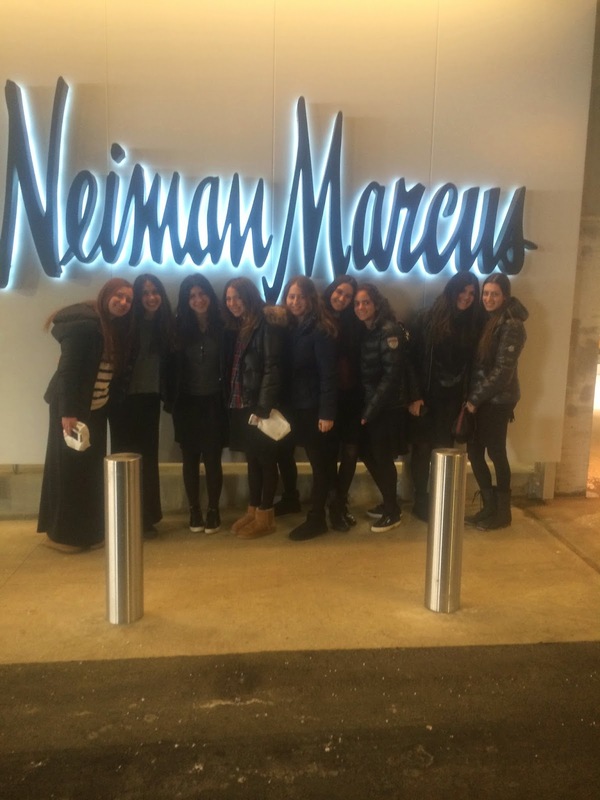 Through the Yeshivah of Flatbush Pathfinders Program, some of our students had the opportunity to explore their fashion and style interests by taking a fashion tour of Neiman Marcus Paramus. The students has the chance to meet and speak with the public relations manager in addition to touring the store. Students learned about the buying and selling process in fashion from people currently in the industry. At a different event, students were given the opportunity to take part in a real fashion show. They experienced the behind the scenes of what really goes on in order to make a fashion show a success. Beginning in 9th grade, the Pathfinders counselors work with each student to discuss their interests and develop their goals. Students are then given a wide range of opportunities of places where they can volunteer, intern and explore their unique academic pursuits and career ideas. Through the Yeshivah of Flatbush Pathfinders Program, we encourage our students to discover and expand their special talents and abilities and explore career options for the future. Whether a student is actively engaged during the school year or in the summer, we are confident that each Yeshivah of Flatbush student will find a path to success. It has been an uncharacteristically cold and snowy - and icy - winter. 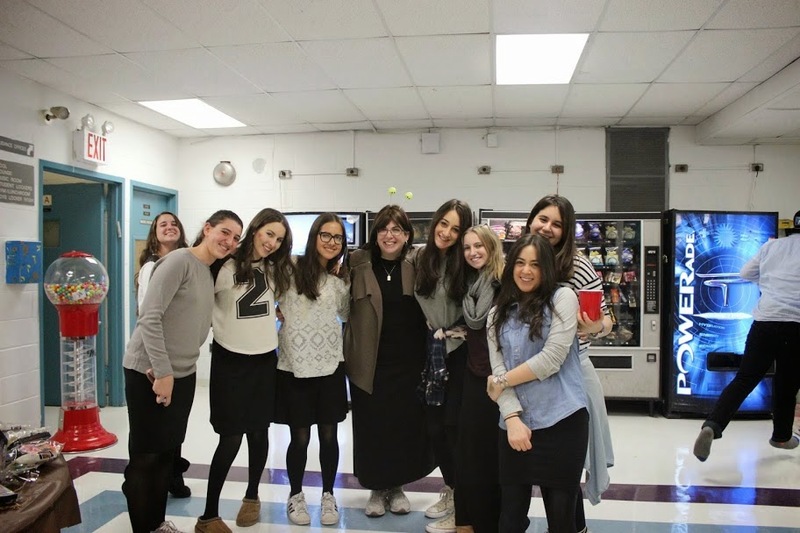 But the Yeshivah of Flatbush sub-basement has been echoing with the sounds of baseballs, softballs and soccer balls – sure signs that Spring is just around the corner. The boys soccer players were equally eager to take to the court. With new goals on order, the boys employed the old metal pipes for a final time with the returning players working out the winter kinks and the newbies looking to impress Head Coach Mark Medetsky and new Assistant Coach David Nachmany (another returning former Falcon looking to bolster the program of which he was so recently a contributing member). With leadership provided by returning seniors Ovadia Fetieh, Jesse Keren and Ilay Fachima, the Flatbush boys looked to impress with drills designed to show off their dribbling and passing skills as well as their shooting ability. The coaches also put those interested in taking over goalie duties through their paces, as the team graduated its goalie from last year’s playoff team and will need a new man to step up and fill the void. Next up in the gym were the Varsity Girls Softball try-outs. 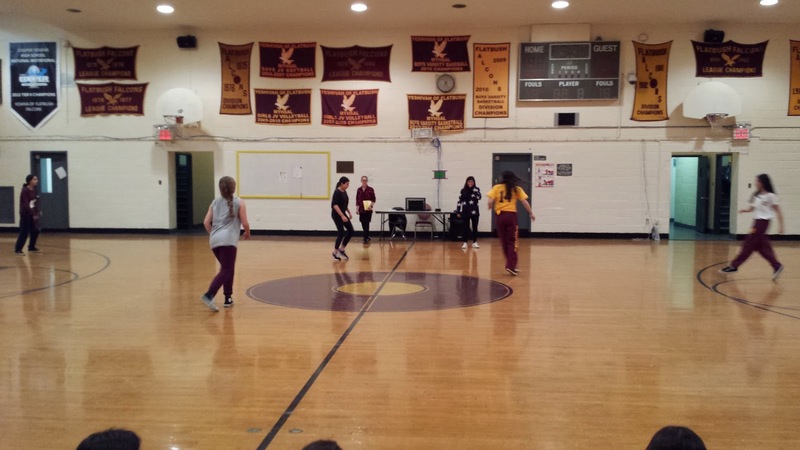 Looking to revive a dormant program, the girls gathered in the HS gym to show the coaches they have what it takes to bring softball back to the pantheon of Flatbush Athletic programs. Coaches Rozan Mizrahi and Renee Dweck, both veteran players in the Jersey Shore Women’s Softball League in Monmouth County, NJ, put the girls through the paces, first evaluating their ability to throw and catch the ball, then putting them through basic fielding drills. The next week saw the girls show off their hitting ability. Senior Renee Sutton looked to be a potentially big hitter for the Falcons, making solid contact from the first pitch. But, the top slugging performance was put on by Sophomore rookie Rose Mishaan. Stepping up with her usual look of grit and determination, Mishaan laced the ball into the nearby stairwell, and then followed that up with line drives back at Coach Dweck (who was tossing in the pitches). With a talented group in place, the biggest challenge facing this group looks to come from the uncooperative weather and the parks department, with which the school is in discussion for securing field space for practice and home games this season. Rose Mishaan rips the ball during the second day of softball tryouts. Baseball held its tryouts under the watchful eyes of veteran coaches Eric Hall and Brett Beard in a facility across the Verrazano Bridge in the distant recesses of Staten Island. In all seriousness though, while the team is returning every member from its 2013 MYHSAL Championship team, the majority of the 2014 roster looks to be made up of seniors. Additionally, it is rumored that the incoming group of freshman baseball players is exceedingly talented. This would be the first opportunity for the High School coaches to evaluate the talent of Flatbush’s future on the baseball diamond. With a heavy load of seniors, evaluating the newcomers will be key in keeping the cupboard full as the program moves forward. The indoor facility would give the players the space to show how well they can field the ball, while also providing both mounds for pitchers to throw to catchers and cages for all to show what they can do with the bat. Returning MYHSAL Pitcher-of-the-Year Senior Ralph Navarro was very excited to put on his glove and toss the ball with his teammates. “I can’t wait to get back out on the field! We are ready to defend our title, and are really looking forward to competing with teams from outside the Yeshiva League for the first time.” Navarro is referring to the team’s entrance into the Columbus Baseball Invitational, the biggest Yeshiva baseball tournament in the country hosted by Columbus Torah Acedemy of Columbus, Ohio. The League schedule is a work in progress, but the team will again play against Ramaz at Richmond County Bank Park, home of the Staten Island Yankees and one of the premier baseball facilities in the metropolitan area. Boys Softball is also underway, with former JV leader Howie Fleischman stepping up to take over the leadership of the Varsity program as well, in the absence of former coach Joe Sciallo. With new Assistant Coach Ray Chehova at his side, Coach Fleishman – no longer in need of crutches for mobility! – was on hand to register all the interested players (of which there are many) and to begin sifting through the group to select the best and most committed to continue the tradition of Boys Softball success at Flatbush. The Boys softball team would also be the first of the Flatbush Spring sports to get outside and play on the fields of Brooklyn. With the ice finally receding, the would-be softballers now had only the frigid air to contend with. But working the boys out on the fields of Marine Park, Coaches Fleishman and Chehova would get the opportunity to see the players not only throw and catch (which they did in the YoF HS gym), but also see how they field fly balls – a skill in need of the open air. The coaches are now busily at work assembling the schedule for the 2014 season. Lastly, the Boys and Girls Tennis teams assembled at MatchPoint NYC in Brooklyn to battle under the watchful eyes of Coach Christine Johnson, Volunteer Coach Elliot Greenberg and veteran Head Coach Michael Gelber (Gelber also doubles as the chair of the MYHSAL Tennis season). With only seven scoring spots per team per match, the competition for roster spots for Girls and Boys tennis is perhaps the most intense in the school. The boys return top performer Senior Joey Dweck, who will look to solidify the top spot on the team at 1st Singles. The girls also bring back their top player from last year in Senior Eileen Sutton who also is expected to secure the 1st singles position. The remaining positions on both squads are clearly up for grabs, and the competition for roster spots for the boys has been so intense that an additional session of tryouts needed to be added to the schedule. The teams have lofty goals for the season, with the girls looking to challenge for the League championship and the boys looking to improve on their League runner-up status from 2013 and this year climb the final hill and bring home a tennis championship to Flatbush! The other Spring team sport, Boys Volleyball, had their try-outs in the fall and have been practicing late Tuesday nights since October. Boys Volleyball will open the season on Tuesday, April 1 as they host North Shore. Game time is 8:00 pm. The new Track Team debuted with a strong showing at the HODS 5K Race in Central Park at the start of the month, and will take on Yeshiva League opponents twice this Spring in meets hosted by Kushner Academy in Livingston, NJ on Sunday , April 27 and Sunday, May 11. Both meets will begin at 10:00 am. To view all team schedules, please go to the Flatbush Athletic website at the following link: (http://www.flatbush.org/content.aspx?rec_id=100161), and click on the link for our school athletic schedules. Why did Hashem create his world starting from only one man? Because every person was placed in this world to complete Hashem’s creation with the talents that He has given them. We each have a task here to complete, and using your talents to make your mark and leave a legacy can help us do so. Sometimes we feel like we cannot make an impact on the world. We tell ourselves we are too weak, too small, and too insignificant to change this world. But that’s not true. Pop culture and media tell us that to change the world you need to be physically strong, classically beautiful, and nothing short of perfect. But Judaism teaches us otherwise. The Torah teaches us that we all have the power to change this world, inch by inch. God gives each of us talents, be they Logic, Creativity, Persuasion or Fortitude. It is our duty, as Jews, to use each of the talents God gave us to its fullest potential by using them to leave a legacy. What is a legacy? It’s more than just leaving your mark. It’s using your talents to serve your family, your community, your humanity and your God. We don’t have to be presidents or kings to leave a legacy; God gave each of us unique talents and there is something each and every one of us can do to leave behind our legacy. It is up to us to decide how we will be remembered when we are gone. 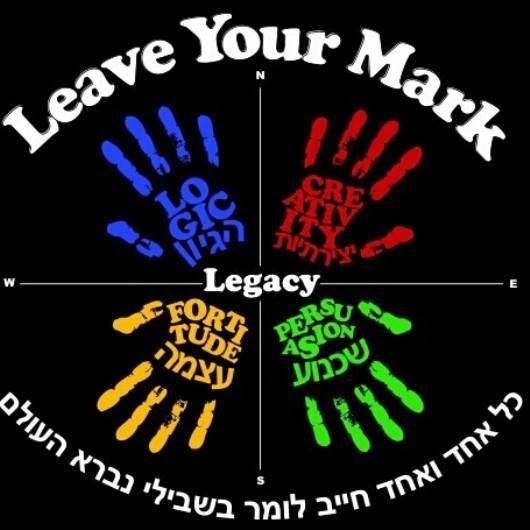 Here at Yeshivah of Flatbush, you are given four years to figure out what your talents are to help develop them. Between our extra-curriculars, our chesed programs, and your daily classes, there are so many chances for self-expression. Use your talents to help your fellow students, your teachers and your school. No matter how small you think your talent might be, you never know what will make a difference to someone else. If something as small as a smile can change someone’s day, imagine what you can do with all your effort. Leaving a legacy does not mean saving the world in one big, dramatic gesture. It means using our talents to help those around us. Wherever we go, be it North, South, East or West, we will leave a legacy behind. What do you want to be remembered for? What will your legacy be? This past Friday, March 14th, the SGO 2014 created the first Purim Carnival in a long time for the entire Yeshivah of Flatbush. After weeks of planning, we came up with tons of fun games and activities to get the students excited to celebrate the festive holiday of Purim. With games from knock down the cans, to ring toss, to bowling, the students had a blast. Other activities included balloon darts, get the hockey puck past Stephen Esses, face painting, iron the beads, balloon animals, hamentashen making, and even a BOUNCY HOUSE that was enjoyed by all. There was a beautiful lunch provided by our fabulous lunch ladies including make your own ice cream sundaes with colorful toppings, salads, pastas, bagels and so much more. There were also popcorn, cotton candy and pretzels being served. 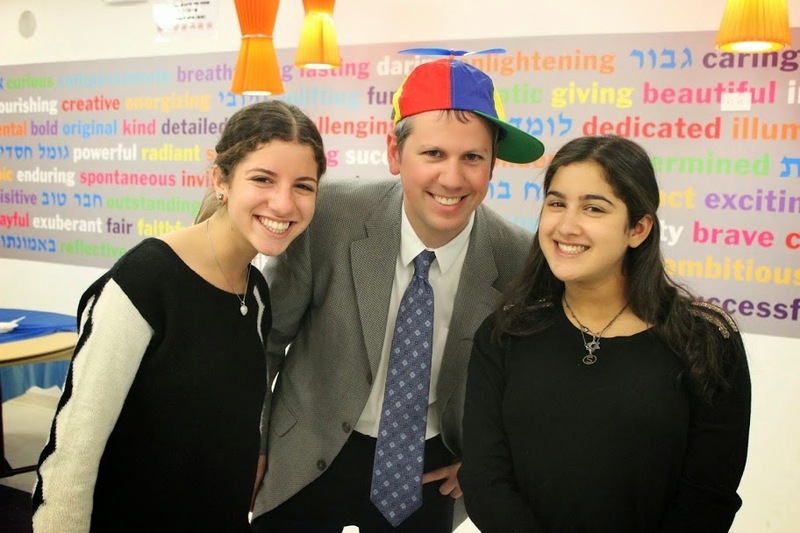 The smiles on students' faces were priceless and the spirit and enthusiasm of Purim filled the air. 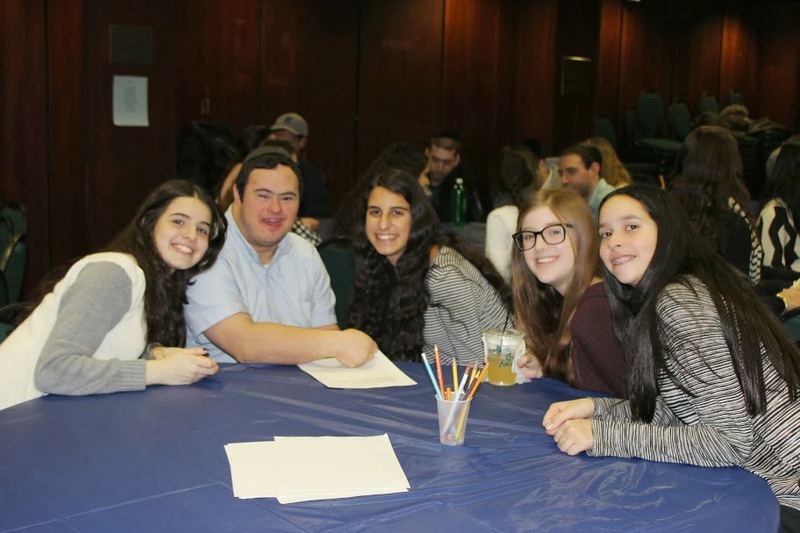 Events like these enhance our students' experience in the Yeshivah and give them a chance to bond with their fellow classmates and teachers in an informal, out-of-classroom environment. Thank you to the students, juniors and seniors running the booths and faculty for your enthusiasm and for your active involvement that allowed the program to come together beautifully. We hope you enjoyed it as much as we did planning it and we were sad to see it end. We hope enhanced your Purim experience here at the Yeshivah of Flatbush and that it was a Purim you'll never forget! We would like to thank Ralph and Ami Sasson for sponsoring the bouncy house and the cotton candy, pretzel, and popcorn machines. On Tuesday, March 11, 2014 the Choices Commission ran their annual Choices Fair for the entire freshman and sophomore grades. Brandishing their stylish new sweatshirts they conducted mini-workshops on just three of the important topics the commission addresses. 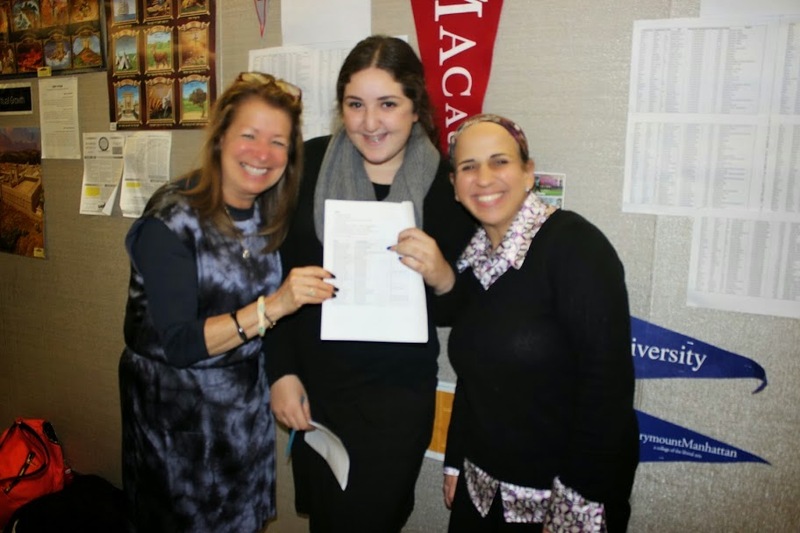 Under the leadership of Ms. Eva Bernfeld, the four Choices Commission Commissioners - Lital Ben-Zikry, Victor Dweck, Jesse Keren, and Lauren Levi, along with 35 other junior and senior members ran each session 21 times. Throughout the day, each freshman and sophomore class had the opportunity to transition between three locations addressing the three topics: bullying, body image and substance experimentation. In each room they became involved with activities demonstrating the negative impact that unhealthy thinking and decision making would have on their lives. Through creative role plays, videos, and interactive activities the students learned important facts. More importantly, these events triggered a thought process weighing out consequences before acting . Each student left the rooms with a small reminder of what had been introduced, from sunglasses to help students “Envision a brighter future”, to anti-bullying keychains, and finally to mirrors encouraging them to look deeper inside themselves. Choices is hoping that next year new students will be inspired to join Choices ’15 to further promote these positive messages. Thank you again to Ms. Bernfeld and the students who coordinated this educational and informative program. This past Wednesday, March 12 (10 Adar II), Rabbi Besser with the help of the Tzedakah Commission hosted our very first Pre-Purim Chesed Extravaganza day. This program was made up of five smaller events. Each one was a success. 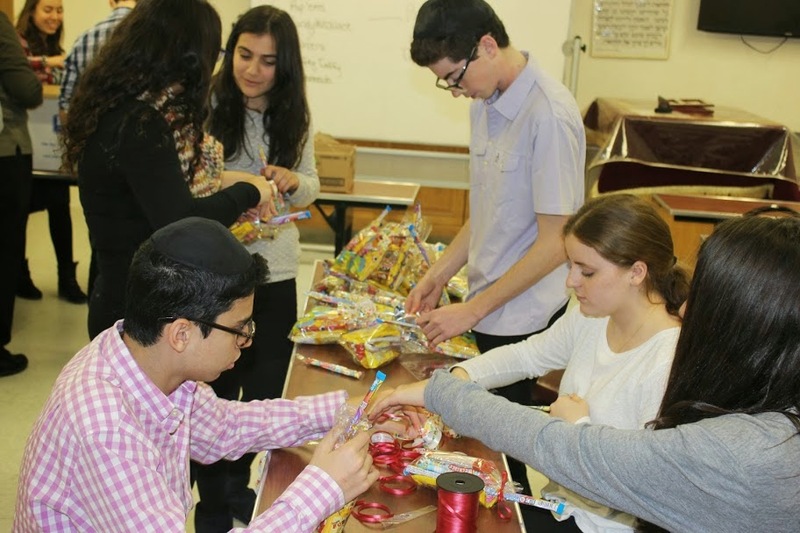 Students packed Mishloach Manot, making over 300 packages for the needy for the holiday. There was Tehillim reading where we had a group of students read Tehillim for the sick. 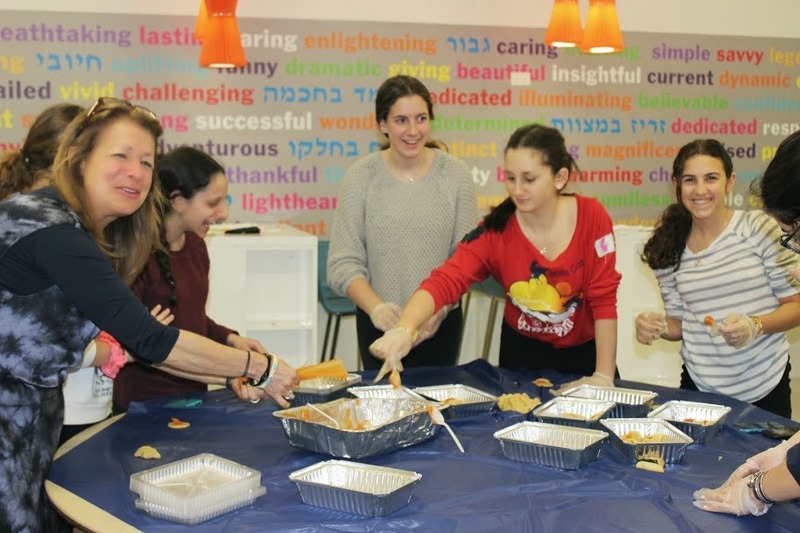 In Cooking for a Cause students baked hundreds of hamantashen for the SBH food pantry. 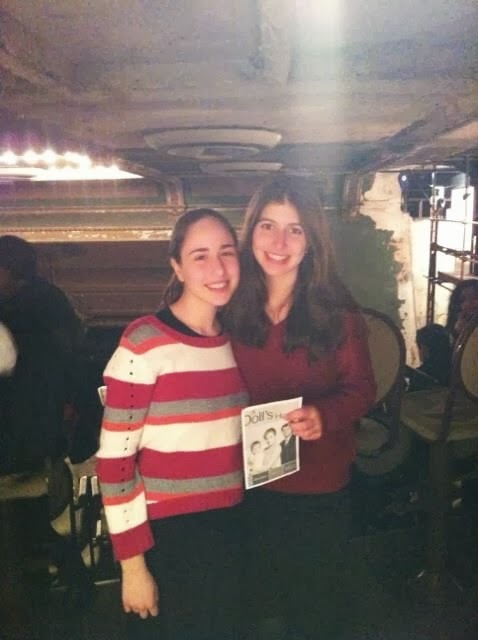 The most grand part of the program was the Ohel/Yachad event. We invited 50+ people from Ohel and Yachad to come spend the night with us. Here they watched videos, made arts and crafts clowns, ate pizza and had a blast with our students. Traveling Troupe & Areyvut Clowns Spread Purim Spirit! 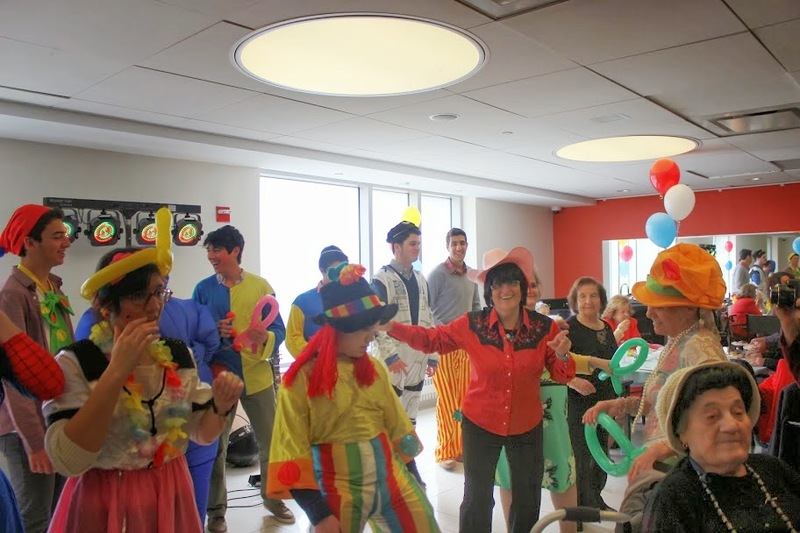 In order to spread the spirit of Purim in the community, some Yeshivah of Flatbush students dressed up as clowns and displayed their musical talents at various nursing homes and hospitals in the area. Everyone involved had a great time! Flatbush’s JV Boys Basketball team arrived early to the Max Stern Athletic Center on the campus of Yeshiva University for what would be the last game of the season, win or lose. Planning to play on a college sized court for the first time, the players entered the arena as one of the last two JV squads still standing. After a close-fought first quarter, the interior size and the outside shooting of the Wildcats proved to be too much for the young Falcons, and DRS came away with a convincing 43-25 victory and the MYHSAL JV Boys Basketball Championship. On the heels of three consecutive playoff victories over top-notch opponents culminating with a hard-fought victory over New York City Division Champion SAR, the Falcons knew they would be in for their toughest test yet. The DRS Wildcats entered the game with an identical division record (10-0) to the Falcons, and like the Falcons also won three consecutive playoff games, albeit the last one on the road in a hostile gym in Paramus, NJ. DRS boasted a strong, physical line-up, heavily laden with sophomore talent, while the Falcons would counter with a line-up that while season-tested, relied on significant input from rookies, with freshmen starters Kevin Haddad and Jackie Mishaan at the key positions of shooting guard and power forward. With most of the crowd in their seats, the players took to the court after the fanfare of full roster introductions of both teams and the playing of the Israeli and United States national anthems. DRS had a full compliment of followers in the bleachers behind the visitors bench (with identical records, Flatbush was designated the home team and dressed for the game in their home whites by virtue of the same coin toss that fortuitously afforded the Falcons home court advantage in the semifinal round of play against SAR and sent DRS on the road to battle New Jersey Division champion Frisch). Flatbush’s fans scattered themselves throughout the bleachers facing the two teams, and with the arrival of the student fan bus (kudos to Senora Shterenzer for her dedication to the Flatbush students on affording the students the opportunity to be in attendance and to support their classmates in competition), immediately started in with a loud and raucous rally chant of “F-L-A-T - BUSH, BUSH, BUSH!” to infuse the team with added energy. Recognizing DRS’s size advantage, Flatbush adjusted its starting line-up for the first time in the playoffs, opting for a greater inside presence with big man David Dayan getting the nod in place of guard Louis Zarif. From the outset, the change paid dividends, as the Falcons battled the Wildcats inside for every rebound, successfully moved DRS’s bigs just a bit out of their comfort zone under the basket and forced DRS to look to secondary and tertiary options on offense. Meanwhile, Flatbush looked to settle in to its methodical offense that they executed with precision in the semifinals. They demonstrated patience on offense and worked the clock in search of good looks at the basket. While DRS opened the scoring with a big 3 from outside (portents of things to come), The Falcons struck gold of their own with a big basket from Sophomore Co-Captain Elliot Beyda to answer right back, bringing the Flatbush faithful to a roar in response to the Wildcat cheers on the opposite side of the Maccabees’ arena. In addition to the customary sizing up of each other by the two teams, the first quarter proved to be a real back-and-forth between them. DRS would take the lead; Flatbush would close it. DRS would look again to string a few baskets together, and the Flatbush defense would step up and deny shots close to the hoop or close from behind on a DRS fast break and at the last moment knock the ball away. And late in the opening quarter, Flatbush took the lead, elating the Flatbush faithful and letting the team in green know they would not be an easy out. DRS would close back to tie the game, but could not extend it, and the quarter closed with the Falcons and Wildcats deadlocked at 11 points apiece. But with the start of the second period, the fortunes of the two combatants would change, with one achieving great success and the other struggling mightily to stay in the game. From the inbounds, DRS kicked its perimeter defense into another gear, virtually shutting down the previously potent Falcon attack, denying passing lanes, pressuring every dribble and closing out on every shot. Meanwhile, the Wildcats equally amped up their offense from the perimeter as well. With Flatbush opting for a big line-up with David Dayan and Abie Rosow together along with the athleticism of Jackie Mishaan to combat the Wildcat bigs inside, they did a very good job of patrolling the lane, battling inside to deny easy baskets and challenging for every rebound. But while Flatbush did a solid job with their interior defense, the Wildcat guards simply caught fire. Specifically, DRS Guard Deutsch had the hot hand. The son of a Flatbush graduate and former Falcon basketballer, Deutch hit four 3-pointers in the quarter. He simply could not miss. In the parlance of the game, he was “in the zone.” Nothing showed that as clearly as the final shot of the half. Hoisting the ball up from the neighborhood of the George Washington Bridge, Deutch drew nothing but the bottom of the net. Bottom line, in a period that would prove to be the turning point of the game, DRS made shots, and the Boys from Flatbush were cold as a winter polar vortex. Flatbush hit a basket at the beginning of the period and another one late in the quarter, but in between all the offense came from the boys clad in green. And when coupled with the Wildcat buzzer-beater from another zip code, the Falcons found themselves down double-digits at 28-15 and searching for answers. If the Falcons thought a change of direction would improve their fortunes, it was not to be. Opening the second half with the ball, the Falcons began with another empty possession while the Wildcats picked up where they left off, knocking down a quick basket with their first possession. But the Falcons would not go easily. The one bright spot for the Boys from Flatbush was the play of their front line. David Dayan showed off a consistency in his play, holding a commanding presence in side for the third straight play-off game, and with Abie Rosow playing solid minutes and showing some more comfort in his second game back from injury, the two provided a scoring presence for the Falcons and forced the Wildcats to settle for shots from outside rather than their usual compliment of points in the paint. Both Rosow and Dayan would finish the game as Flatbush’s top scorers with 7 and 8 points respectively. As a result, Flatbush and DRS finished the third stanza with 7 and 9 points respectively. It was a respectable performance, but the deficit still grew by two, and only 8 minutes were left to play to decide the JV Championship. While Flatbush battled valiantly to stay in the game, the lack of offensive production outside the paint proved to be the Falcons undoing. The normally reliable backcourt of Kevin Haddad, Elliot Beyda and Louis Zarif along with power forward Jackie Mishaan plainly and simply could not hit shots. On a normal occasion, when one player is cold, his teammates have been able to step in and pick him up. But on this day, it was a clean sweep. All four were as frozen as a penguin in an arctic freeze. Clearly, the DRS backcourt defense had something to do with this, but when the open looks were there, the shots just would not go down. All the while, DRS grew more and more confident. And as the seconds ticked away, the lead kept getting a little bit larger and a little bit larger and a little bit larger. To their credit, like their Varsity counterparts displayed all season, the JV Falcons never quit. Every player on the court played the game at 100%, believing to the last that if they could just find their shooting stroke, they could climb back in. But on this day, it was just not to be. When the final buzzer sounded, the Falcons ended up on the short end of a 43-25 final score. It was a disappointing way to finish. Nevertheless, for a team with a large freshman presence and sporting a new system under a new coaching staff, the team accomplished much in making the championship game, giving the Flatbush faithful a glimpse of what promises to be a very successful future. The Falcons were led by David Dayan and Abie Rosow, who in addition to leading all Flatbush scorers, tallied 10 and 5 rebounds respectively. The team finished the season undefeated in divisional play, taking the Brooklyn Division of the MYHSAL registering 10 wins against no losses. They finished the season with an overall record of 19-5 (13-1 in MYHSAL play). On Thursday, 3/13/14, members of the Flatbush Girls Varsity Soccer team spent the evening helping prepare Mishloach Manot. Joining with Assistant Coach Emily Shrem, the girls came together at Congregation Shaare Shalom (located on 21st Street and Avenue S) to help package the seasonal gifts of food and sweets as noted in Megillat Esther in celebration of the preservation of the Jewish community of Persia in the face of annihilation at the hands of a trusted government official. Over a two-hour period, the student-athletes assembled, wrapped and set out nearly 300 packages for delivery before Purim. The goods were donated by the members of the congregation, and in addition to sending some to the membership of the shul, many were set aside for the purpose of sharing the holiday spirit with those less fortunate in the community. In addition to the poor, many of these Mishloach Manot were delivered to Sephardic Bikur Cholim (Kings Highway & East 4th Street) and the Ahi Ezer Senior Citizens Home (Avenue S & East 17th Street). After looking back on the evening, Coach Shrem shared the following observation. “Everyone who came was a great help. The girls were tremendous and it was a wonderful experience. I can’t wait to do more Chesed projects with the team!” What a wonderful and meaningful way to spread the message of Purim while also sharing some sweet treats with those in the nearby surrounding community. 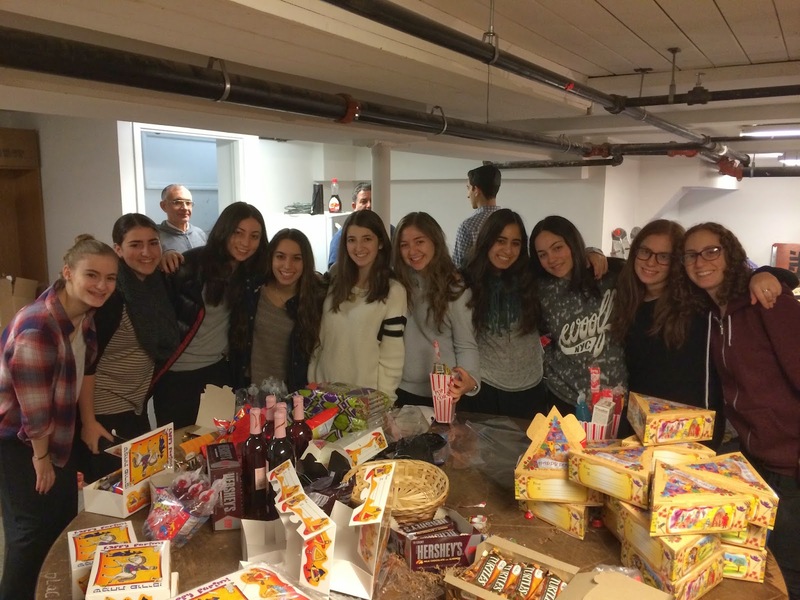 The participation of the Girls Varsity Soccer Team in packaging goods for Purim at Congregation Shaare Shalom is in following with the Athletic Department goal for each level of each team to engage in a Chesed project that provides our student-athletes with leadership opportunities and gives back to the community. Chazak U’Baruch to all the members and coaches of the Varsity Girls Soccer team! As the roar of the applause died down, I took a moment to consider how fortunate I was to be in Washington D.C. and watch history unfold. 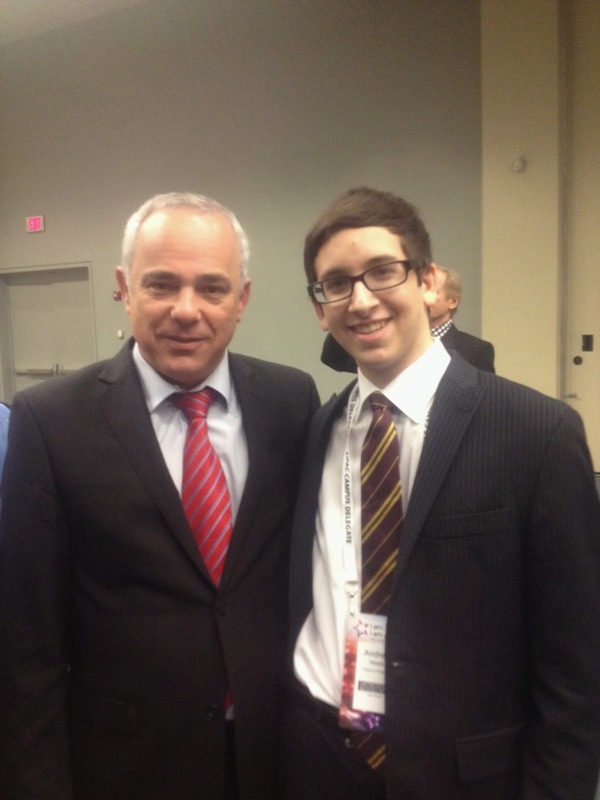 Last week, the American-Israel Public Affairs Committee held its annual Policy Conference from March 2-4, bringing over 14,000 pro-Israel activists together for three days dedicated to strengthening the U.S.-Israel relationship. 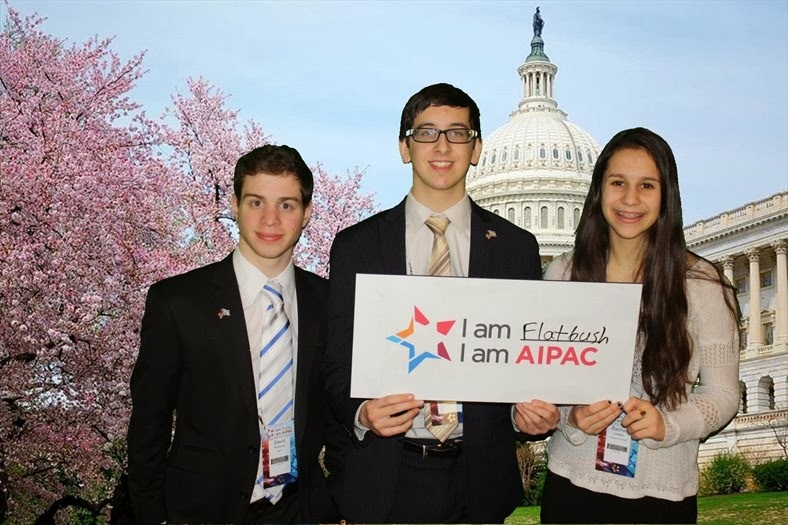 The conference marks the pinnacle of pro-Israel activism in America, and was an exciting event for all attendees, including Yeshivah of Flatbush students Rachel Linfield, David Feintuch, and Jacob Setton, who attended the conference alongside me. At Policy Conference (PC), two types of sessions were given - general sessions and breakout sessions. General sessions bring all 14,000 attendees into one huge conference hall to listen to a wide array of fascinating, interesting, and prominent speakers, leaders, and innovators. Breakout sessions are smaller and more numerous, and enable you to choose different topics to focus on. Speakers at the general sessions included Secretary of the Treasury Jack Lew, Secretary of State John Kerry, Senator Schumer, Senator Menendez, editor David Horovitz, rabbis, pastors, union leaders, and Israeli Prime Minister Netanyahu, amongst many others. Prime Minister Netanyahu's speech was certainly the most moving and passionate, having been saved for last and delivered in a charismatic, strong, and powerful manner. The 40 minute speech stressed the danger posed by a nuclear Iran to Israel and America, encouraged further US-Israel cooperation, delineated his views on the peace process, and viciously condemned the anti-Israel boycott movement. After his speech, all 14,000 activists were given the opportunity to lobby their House Representative and Senator on Capitol Hill. 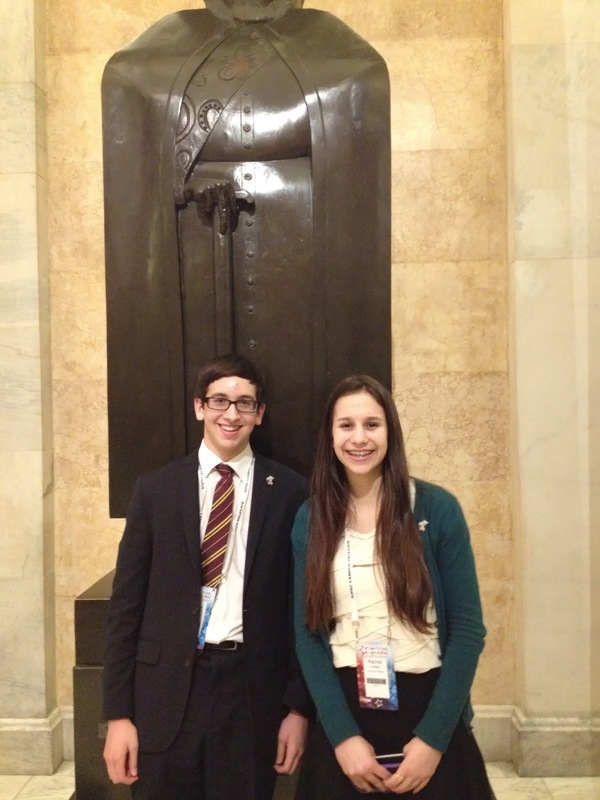 This year, AIPAC was able to reach all 535 members of Congress in order to lobby them. From Flatbush, we joined up with a few AIPAC leaders to lobby Congressman Hakeem Jeffries, who was highly receptive to us and concurred with our viewpoints. The time that he took to meet with us was greatly appreciated by us all. Moreover, his legislative assistant remembered that we had brought about 25 Yeshivah of Flatbush students in December to lobby his office, and said he was proud to see us returning and maintaining the commitment and activism, and that if we don't speak up then we can't impact the country we will inherit. He couldn't be more right. AIPAC understands this. Over the past few years, the numbers of attendees at Policy Conference has doubled at an incredibly remarkable speed. AIPAC has dedicated tremendous time into outreach programs, recognizing that the state of Israel faces more threats than ever before. In a few years, they won't fit into the Walter E. Washington Convention Center anymore. A day after Policy Conference, the House passed the U.S.-Israel Strategic Partnership Act by a hugely bipartisan vote of 410-1! Only through our support and help can a strong U.S.-Israel relationship be maintained. Policy Conference certainly proved it. The College Bowl team had their final Yeshiva League competition for the year at Yeshiva University on Thursday, March 6, hosted by MTA. The Varsity team participated in highly competitive, down to the wire matches, while the Junior Varsity team won every single game in a triumphant clean sweep against SAR, MTA, and Magen David. Many of the Seniors were overwhelmed with emotion due to the realization that this would be their final College Bowl of their High School careers. The Varsity captain, Albert Mishaan, along with the JV captain, Joey Cohen, led the College Bowl team in one last pizmonim session on the van ride home. This 'joyous singing' has become a College Bowl tradition and was officially passed on from the Varsity to the JV team as we exited the van. 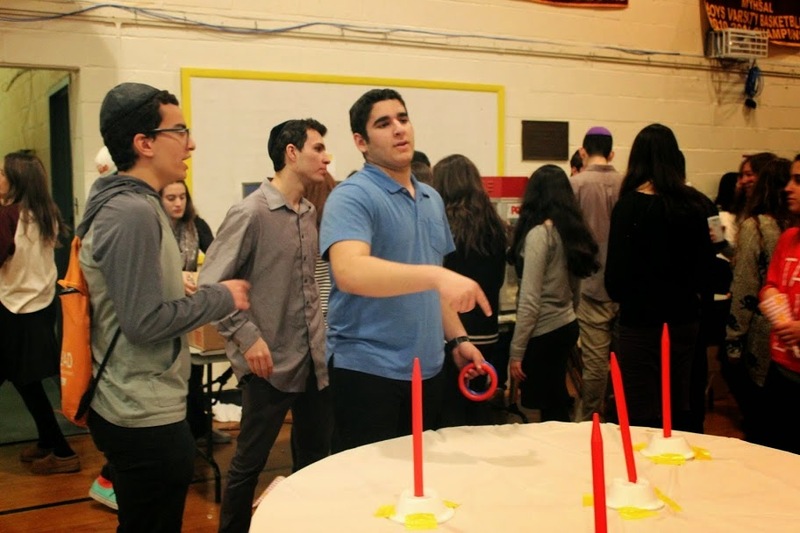 The Yeshivah of Flatbush Joel Braverman High School's Model Congress team participated in the annual Yeshiva League Model Congress event, organized and hosted by HAFTR High School, on Wednesday, March 5, 2014. After an inspiring keynote presentation by renowned defense attorney Benjamin Brafman, over 300 student "delegates" from tri-state area day schools split into various congressional committees to learn firsthand about the legislative process through intense and passionate debate by presenting, amending and voting on original bill proposals. Senior Jacob Setton and Juniors Victor Zeitoune and Ness Azizo each received Honorable Mention awards for outstanding performances in their committees. While Raizy Cohen, Bob Husni, Michael Bildirici, Daniel Cohen, David Mann, Jacob Silvera, Saul Esses, Eli Cattan, Binyamin Abramowitz and Billy S. Dayan also participated at a very high level, with most getting their bills passed with ease. The event was highly successful as both an educational and enjoyable experience for all concerned. Thank you to Mr. Brian Katz for coaching and supporting our team. Scott Olsen once said, “Every person is defined by the community they belong to.” If there's anything we've learned here in Gibraltar, it’s that. Upon entering Nefusot Yehuda, one of the four local shuls, on Friday night we were welcomed like celebrities with everyone greeting us and wishing us a "Shabbat Shalom," leaving us with full appreciation of our people. After singing through the true Sephardic melodies, we caught up with some of the local teens and had our "sneak peak" of the former mayor of Gibraltar. Over dinner, we heard from the Chief Rabbi of Gibratar, who happens to be related to some important physicians. We also heard the inspirational story of our own guide, Moshe, and his persistence in observing Mitzvot in a city with few Jews. On Shabbat morning we were welcomed into Shaar HaShamayim, an eighteenth century synagogue, the first and oldest in the land, where we were once again greeted with warmth and smiles. It was here where the shamash offered our very own Rabbi Beyda to address the entire kahal, where he rocked it, talking about how it is critical to not be judgmental of others. On the way out, one of the congregants gave us a bit of a crash course on Gibraltarian history and most importantly, how to pull off the well-known British "top hat look." After lunch, we had a fun and laugh-filled meeting with the Former Mayor of Gibraltar, Solomon Levy MBE; who was the prime example of his favorite saying "as an an Englishman gets older he gets dapper." This iconic figure showed a glowing sense of humor, education and most importantly, class. 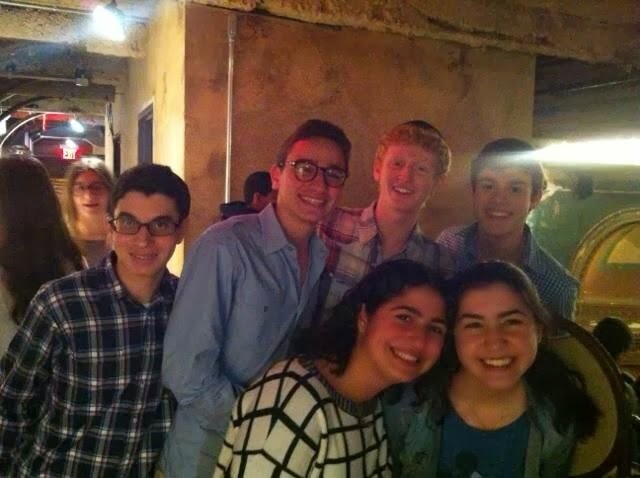 After short Shabbat naps, we went to the local Community Center to hang out with local Jewish high school students. We had a great time playing ping pong, soccer, and billiards and just mingling with these really down to earth kids that had so much in common with us yet were so different. In the competition between USA vs. Gibraltar, we lost soccer (Victor Dweck, Shaya Tawil, and Rabbi Beyda) but took the Ping Pong championship (thanks Ray Mosseri!). Sarah Cohen (aka Happy takes Spain) and Sylvia Frastai made new friends, especially someone that looks remarkably like our very own Senior Council member Francine Shamosh. Shaya Tawil performed a moving Havdallah in which he did his best Rabbi Besser imitation. 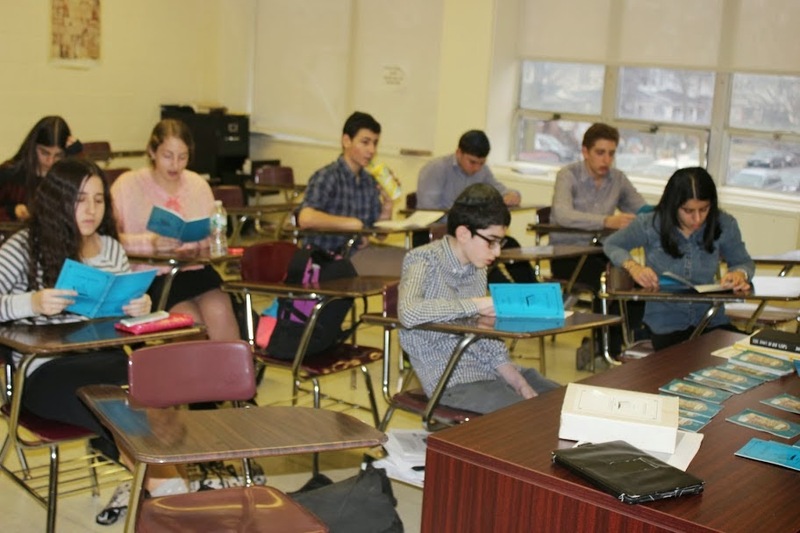 On Wednesday, February 26th, six students from the Yeshivah of Flatbush competed at Heschel in the yeshiva league's first MATHS Competition. Representing the school were seniors Joshua Sitt, Abie Tawil, Gaby Kabariti, and Ralph Navarro, and juniors Louis Fanco and Sarah Levy. The students, under the guidance of Dr. Robert Goldberg, who teaches quantum mechanics and problem solving at the school, prepared for the meet by discussing different ways to look at math problems and brushing up on the history of famous mathematicians. The schools they were up against included Ramaz, SAR, Ma'ayanot, and Westchester Hebrew High School. In the games, anything related to math could be asked, from derivatives to dot sequences to harmonic means. Flatbush started off strong, tied with Frisch in the first game until the very last question, losing by a point. All in all, Flatbush came in 4th place out of the eight schools that competed. As it was the first such competition, the students came in unsure of what to expect, but came out with valuable experience and a feel for how to be even more prepared for next time. And it was definately a fun opportunity for students who love math to show off what they know. Thanks again to Dr. Goldberg and Mrs. Shulman, and congrats to the Math Team!